157th ‘Urs e Mubaarak of Muqaddas Maulaa will be remembered for years as the Rawzah Mubaarakah was illuminated with Qur’anic Nujoom. This means that the recently renovated Rawzah was embellished with Qur’anic Stars i.e. verses cut on Acrylic sheet and the names of Ambiyaa placed on glass pieces. 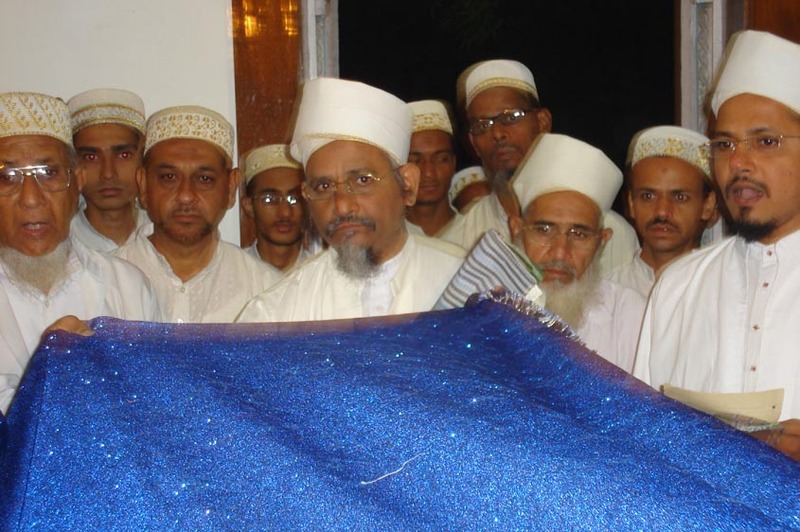 Ali Asghar Safiyuddin bhai Dholkawala took Razaa from Saiyedna saheb (tus) before two months for the work of the Rawzah. Apart of Rawzah, certain other works of Shehaabi Masjid and the drinking water system for Zaa’ereen those who come for the Ziyaarat in Jannat ul Mumineen-Qabarastaan was also carried out and made functional. 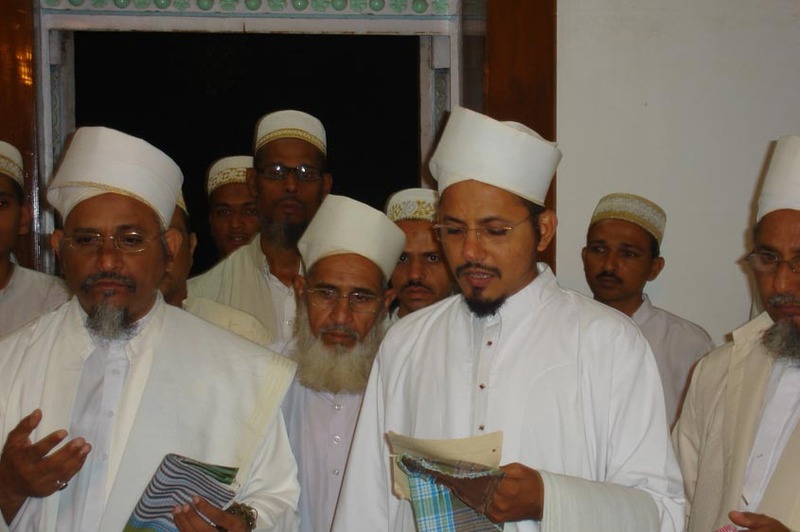 In the Rawzah, the ‘Arabic Bayt "Tahayyaat ul-Mohaymene" composed by Saiyedna Fakhruddin saheb (aq) in the shaan of his grand-father Saiyedna Mufeeduddin saheb (aq) was recited by Hudood e Da’wat on the Qabr e Mubaarak of Muqaddas Maulaa. During the majlis in the Shehaabi Masjid, Aqaa Maulaa called the members of two Anjumans, Anjuman e Abi Taalib and Anjuman e Shabaab e Shehaabi. The former collects the fund from mumineen and they send Zaa’ereen to Karbalaa and Najaf. The latter looks into the affairs of Qabarastaan and they see to it that Zaa’ereen do not face any difficulty and do ziyaarat with peaceful mind. Bayaan Mubaarak: The land of this Earth is never devoid of Aal-e-Mohammad Imaam uz-Zamaan (sa) or his Da’i | By offering Namaaz a Mu’min is not doing any favour to Allaah Ta’aala but it is compulsory on him to bow down near his Khaaliq for the ne’maat he has been bestowed upon | The Majlis for Muqaddas Maulaa is called Majlis ut-Taqdees or Majlis ut-Tarhaam i.e. the Assembly of Sanctification and Mercy that results into the Allegiance of the Hazrat of Da’i | Rahmat originates from the top and Ma’refat starts from the bottom who is present as Saheb-e-Da’wat in front of the eyes of a Mu’min | Four times Allaah-o-Akbar in the Azaan has deep-rooted meaning | You all have come here at the Rawzah of Maulaa Mufeeduddin saheb (aq) to take his barakaat and to become pure | You are under the Rahmat of Allaah Ta’aala until and unless you commit any sin after offering Namaaz | Four pillars of the Merits of Maulaana 'Ali (as) – ‘Ilm (knowledge), ‘Iffat (chastity), Shujaa’at (bravery) and ‘Adaalat (justice) | Nass Mubaarak of Saiyedna Shaikh Aadam Safiyuddin saheb (aq) on Saiyedna ‘Ali (aq) in this month. During the Shab-e-Urs of 39th Da’i-e-Mutlaq Saiyedna Mufeeduddin saheb (aq) in Jannat ul-Mumineen on 5th Rajab, Mazoon ud-Da’wat Syedi saheb (dm) explained in the most lucid way the Waaqe’ah of the birth of Maulaana Ali Ameer ul-Mumineen (as) in Ka’batullaah and why this nooraani wilaadat took place there only. He explained the importance of the book written by Muqaddas Maulaa on the topic of Sighting of the Moon and our belief regarding it. Through the words of wisdom, he expounded the decree of Allaah, His Da’wat, His Da’i, His Izn (Razaa), His ibaadat, His believers and how the face and tongue of a mumin is the book of his deeds. He reiterated the fact that, by the existence of Da’wat there is the survival of the Jamaa’at of mumineen, as this Da’wat is governed by the divine law of Allaah through His representatives. “Allaah us-Samad”, Allaah is Eternal and He is sovereign and free from anything and anyone. He is our Lord (rabb), our Sustainer (raaziq), our Master (maalik), whether we pray or not, He is least concerned with it and His status doesn’t change by the level of our obedience. He is the one who was, who is and who will be the same unbounded by time (zamaan) and place (makaan). It is our position that depends on our love, respect, trust and conviction of our Master and His representatives-Du’aat. If we don’t bother with our spiritual relationship (ruhaani ta’alluqaat) with the spiritual institution-Da’wat which began before the creation of the earth and heavens and which stands on the foundation laid by our Master, then we should be aware that with every inch of disobedience (inkaar) and negligence (ghaflat) we will be demoted in our status. And with the depth of our heart if we believe in each and every tough and pleasant command of our Master then we will be promoted with higher status (darajah aaliyah) in the Hereafter (Aakherat). We are confined at the bottom of atmospheric layers and we are surrounded with the cage of elements and matter (qafas-e-ansari) with the restricted movement and restrained powers. Our Master’s power encompasses all the small or big things beneath the earth, on its surface and above it, “Innallaaha alaa kulle shay’in Qadeer.” Volcanoes, floods, earthquakes, storms, epidemics, famine, accidents etc is the signs of our Master’s power, will and admonition. All these hardships are the source of warning due to which we have to maintain wellness and harmony within ourselves and in our surroundings. When a man boasts himself of getting more and more power over nature, he is overturned and overthrown by the fury of the Most Powerful Master. The saheb of lower status (darajah daaniyah) in Da’wat ul-Haqq is the door (baab) and entrance for the saheb of upper status (darajah aaliyah) i.e. Mukaasir is the door for Ma’zoon, Ma’zoon is the door for Da’i, Da’i is the door for the Da’i ul-balaagh then comes Hujjat, Baab, Imaam, Wasi, Nabi. In the same way the saheb of upper status is the abode of salvation (daar ul-jannat) for the saheb of lower status. So our Muqaddas Maulaa is the Daar ul-jannat for all of us and he is the Baab of our Imaam uz-Zamaan (as). Doing the ziyaarat of our Maulaa is indeed getting benediction (barakaat) from the angels of Paradise and presenting ourselves in the Imaami Hazrat. Our Du’aat is the medium (waseelah) for the fulfillment of our Du’a and they don’t need our Faateha-khwaani for their maghferat but it is we that we need their intercession for seeking pardon of our misdeeds and mistakes (ma’siyat). So by reciting the salawaat or Faateha (du’a-e-taqdees) of our Muqaddas Maulaa we are doing the du’a of our well-being and najaat. Our deen has its roots in remaining patient in every shortcoming that we face. With ever increasing demands, needs and expectations we are feeling too insecure and becoming highly impatience. This is the major cause of the stress developing into bombshell which explodes with the smallest episode of unrest in our life. We should see into the life-style (seerat) of our Du’aat who reached the zenith of justice and patience. The Qubbah Mubaarakah of our Du’aat-e-Keraam (aq) among the quboor of the mumineen in our qabarastaan “Jannatul Mumineen” is like a Sun in the sky where the light of other shining stars is blended with the shining light of the sun and their existence is never felt. Same is the haqeeqat with our Du’aat-e-Muqaddeseen (aq), on whose quboor there is the nuzool of malaa’ikah, ambiyaa and awliyaa (as). The Rauzah of our Maulaa is the baab (doorstep) of du’a, tasleem, maqaam-e-sajadah of kissing the earth, waseelah, itminaan, haajat-rawaai, mushkil-kushaai, jannat, rehmat. The qabr-e-anwar is not only the qabr of Muqaddas Maulaa but it is the majma’ (culmination) of all arwaah-e-saaleheen (souls of pious persons) who were in the sayaa of bay’at-e-Imaam uz-Zamaan (as) at the time of the Da’wat of our Muqaddas Maulaa. In the year 1255 AH our Maulaa wrote a book named “Risaalah Ibaanah wal Hilaal” focused on the refutation of the custom of seeing the moon in the beginning of Ramazaan and Eid by non-Isma’ili Bohras. He proved this practice as wrong and meaningless by giving arguments from their own books, ahaadees and Qur’anic verses. Ahlul Bayt (as) never practiced it and the ilm of the calculation of Kabeesah has originated right from Rasoolullaah (saws). The Imaam or Da’i, in true sense, is our moon and their farmaan for the beginning of a month never goes opposite to what is accounted by our Ahlul Bayt (as). Each and every deeni amr revolves around the razaa of our Maulaa. Our Muqaddas Maulaa wrote a memorable ash’aar in a very lucid and simple Arabic language starting with “Tahayyaatul Mohaymene kulla yaumin, Alad Daa’il waraa aalal maqaami”, Salaam and Tahayyaat of Allaah be on the Da’i who is the saheb of sublime status on each day. “Wa yassir Ya Elaahi kulla usrin, lemay yarju be-it’aamit ta’aami”, O Allaah, make all hard things easy for the one who wishes to serves food to the mumineen. These are only the excerpts of it. Our Nass-e-Jali (the explicit appointment of saheb-e-haqq) has continued uninterrupted right from the Daarul Ibdaa’ which is the source of Ilm-e-Jaari and Noor-e-Saari (divine knowledge and light) and is revealed on this earth from Aadam Nabi (as) till today and will unceasingly come till the Day of Judgement. Our A’immat and Du’aat have written about the entire silsilah (chain) of our Da’wat-e-Haadiyah, at numerous places, which does not exist with other people.  Saiyedna Mufeeduddin saheb is 39th ad-Da'i ul-Mutlaq who succeeded his brother Saiyedna Hameeduddin saheb, who are the awlaad-e-athar of Saiyedna Shamsuddin Shaikhali saheb, the esteemed Da'i from Maulaai Nuhji descendants who showered ne'mat of hidaayat on mumineen for waqt-e-daraaz of 59 years.  Saiyedna saheb took the reponsibility of Da'wat-e-Faatimiyah on 30th Ramazaan ul-Mo'azzam 1252 AH and did untiring efforts for the upliftment and welfare of our community for 30 years and left for permanent abode on 6th Rajab ul-Asab 1282 AH. Rauzah Munawwarah of Saiyedna Saheb situated at Jannat ul-Mumineen is the most frequented nooraani place where haajatmand mumineen come and by the waseelah of Muqaddas Saiyedna their aspiration and manshaa is fulfilled with Dua'-e-Khayr.  Maazoon ud-Da'wat presided the 146 th Shab-e-Urs majlis of Muqaddas Maulaa and after Qaaseedah-khwaani he gave hidaayat to mumineen to strenghten their Isma'ili Taiyebi Aqeedah and never listens to outsiders or those who have left our community. They are those unfortunate people who have left the company of a honeybee and got dumped in the filth of dirty housefly. Allaah describes honeybee as a sign of purity and carries the quality shifaa and obedience of his master. Maulaana Ali, the master of mumineen is also the master of honeybee and both carries the same characteristics; therefore those who have lost the mastership and obedience of Maulaana Ali and his Ahl ul-Bayt (as) have certainly lost the rehmat from Allaah. They are sure the food of Hell-fire.